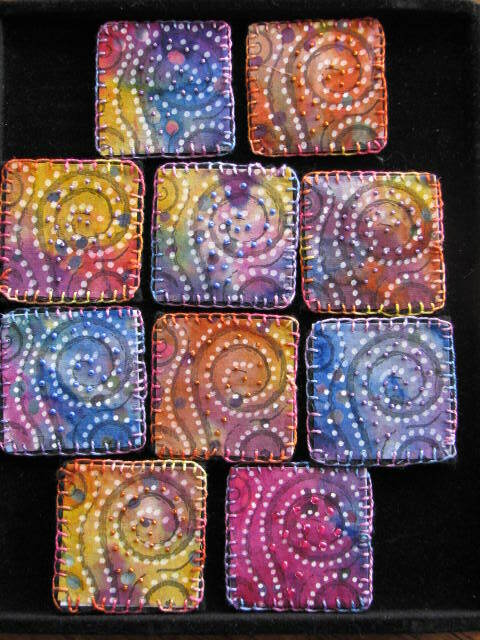 I’ve been working on the 2″x2″ fabric square swap hosted by Belinda Spiwak at Mixed Media Art Friends. I played with lots of ideas and finally settled on this. The fabric is a Bali hand dyed in rainbow colors. I used a flourish rubber stamp with Staz-On black ink, then outlined the swirls with a Sharpie Poster Paint (water based) pen, then added some small beads for depth and texture. The middle layer is a thin version of Timtex. I kept the upper left corner free from any 3D embellishments. Belinda will be punching a hole and inserting a small grommet so that we can hang this on a hoop. 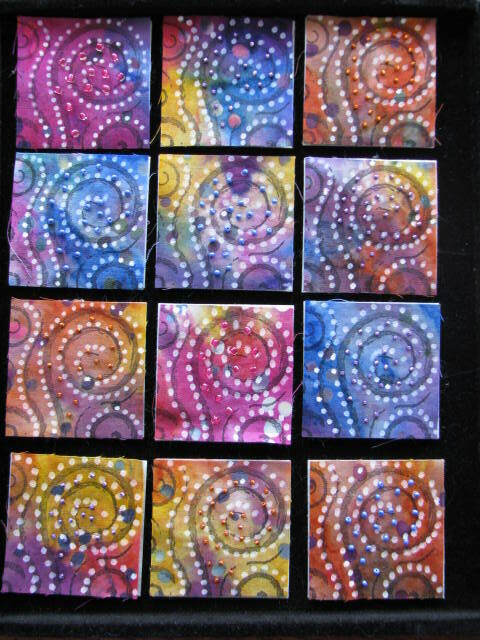 Here are what they looked like before I put on the backing and finished the edges. Here are the finished squares. The back is a black wool felt. I used a variegated floss and buttonhole stitch to finish the edges. This entry was posted in 2008 and tagged embroidery. Bookmark the permalink. Hi Elizabeth. Thank you for the comment. Actually I buttonhole stitched all three layers together at the same time. The middle layer is Peltex (a thinner version of Timtex interfacing) so it was pretty easy to get the needle and floss through it.